It is my pleasure to take part in the blog tour for Sophie Andrews' new book, Be More Jane. I will be sharing my review of the book later in this post. I was thrilled to be part of the tour as I have felt I've known Sophie for a long time. She is such a lovely young woman and having this book published could not happened to a nicer person. Congratulations, Sophie. I'm so proud for you. Jane Odiwe illustrated the book. I'm sure many of you are familiar with her watercolors. She is such a talented lady and has done an outstanding job with the paintings for Be More Jane. Congratulations to you, as well, Jane. Isn't this a gorgeous book! It is hardbound and has the cut-out with a painting visible. One of you readers will be the lucky winner of one book! Isn't that nice! Below is more information about the book. Then my thoughts will follow. Be More Jane is a delightful book! Sophie Andrews has done an excellent job of picking life lessons on which to elaborate. Some of the topics included are having fun in life, being in love, appearances, happiness, family, marriage, money, and others. I loved how Sophie expounded on each life challenge. 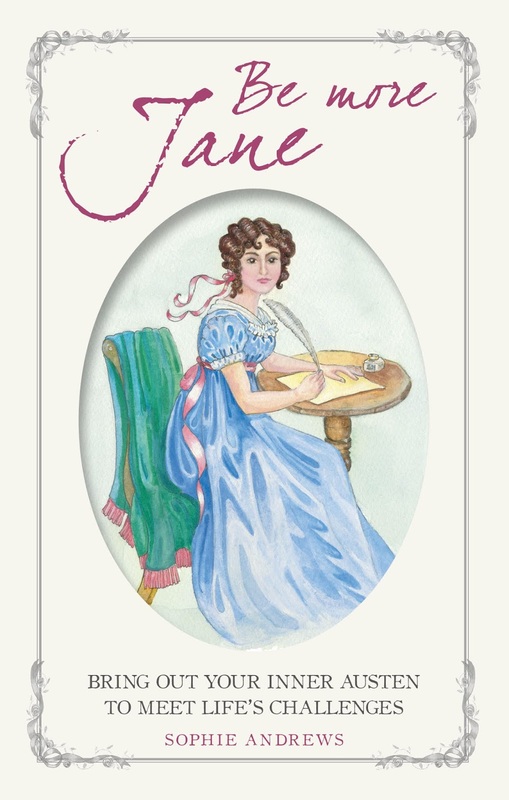 For some she used characters from Miss Austen’s novels, and how Jane wrote those characters. Jealousy is one of the lessons, and who better than Caroline Bingley to be included in it! Through Jane, it is shown how jealousy never pays. 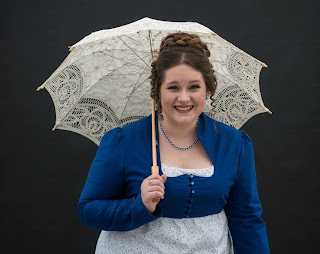 For other life lessons, Sophie used some of Jane Austen’s letters and things Jane said, relating how each applied. Well done, Sophie! At the end of each section or life challenge, Sophie summarized with three main points to be learned or contemplated. I found those recaps an added bonus that I enjoyed. They were succinct and stated in a way that anyone could remember and apply them. The talented Jane Odiwe illustrated the book with her lovely watercolors. Each one is beautifully done and pertains to the topic at hand. I believe there are eighteen paintings throughout the book and I looked forward with anticipation to each one. Be More Jane is a quick read of only sixty-two pages and well worth the time spent reading it. The life challenges and related thoughts are good for anyone of any age. Everyone can gain something from this delightful book. The illustrations are the finishing touch to make Be More Jane a one-of-a-kind keepsake that any Janeite would love to have in their possession. I will treasure mine. I highly recommend this book. 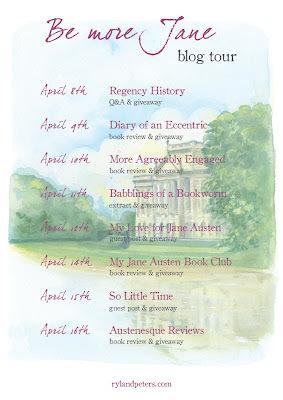 CICO books, Yvonne, and Sophie, thank you so much for the opportunity to be a part of this blog tour. I would not have missed it! Dear Readers, the publisher is giving away one hard copy of the book and it is available to all in the US, Canada, and Europe. Leave a comment telling us what you think about the book, my share in the conversation, or just send Sophie and Jane some love. Be sure I have your contact info so I may let you know if you are the randomly selected winner. The giveaway will end at 11:59 P.M. Central Time on the 16th of April. Good luck to all. Thanks for stopping by and commenting, Elaine. I hope you get to read it soon. It is such a lovely book. Good luck in the giveaway! Thank you for following my tour! Hi Sagan. I'm so happy you stopped by. I'm thrilled she wrote a book too and I love her blog! Good luck! That is such a lovely comment, thank you. Thank you for being such an avid follower. Good luck in the draw! Life Lessons sounds interesting, all complied for me to study and learn from. Very nice. Thanks for featuring Sophie here, and Best Wishes. Thanks for dropping by, Jen. They are really neat and Sophie kept it easy to read and follow. I loved it. Thank you, and good luck! Jane has helped me in life so much. Isn't it lovely! Good luck in the giveaway, Denise! Terrific concept and what a delightful way for you to share your passion for Jane with all of us, Sophie! The illustrations by Jane Odiwie are charming. The entire book is delightful! It is a treasure! Thanks for visiting, Regina. Thank you. 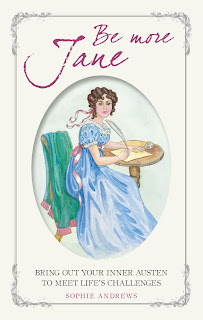 it was fun to write and nice to be able to write such a book as Jane has meant so much to me over the years. Good luck! It sounds just lovely, Janet Glad to know a little of what to expect, thanks! Sophie and Jane did a great job between them. You are welcome, Sophia. I think you will like the book. Yes, Sophie and Jane did a great job. It's a beauty! Thank you very much :) good luck! Just love the whole idea of this! What talent from both Sophie and Jane! Would be wonderful to own this book and add to my collection of unique and creative 'Jane Austen' books! Thank you! I love the whole idea too. They are talented ladies, for sure! I hope you get to own the book, Carole. It is definitely a collectible. Good luck in the giveaway. Good luck - I hope it one day is added to your collection! Thank you for hosting Sophie and her book. I look forward to reading it soon. She is a lovely young lady and deserves the best. Wishing her great success in her sale of the book. Thank you for the chance to win and add to my vast collection of P & P variations. Hi Maryann. You are so right about Sophie being a lovely young lady. I hope her book does really well too. Thanks for taking the time to stop by and comment. Good luck! You two are too kind. Thank you for your support over the years. It means a lot. Good luck!